So you have got your new iPhone 6s, and shoot the 4K videos with the latest iPhone model. Shooting 4K video is really an attractive feature on iPhone 6s and iPhone 6s Plus, and it becomes possible to use iPhone to shoot an excellent movie. But enjoying the videos on iPhone 6s and iPhone 6s will be restrained by the screen size of the devices. 4.7 and 5.5 inches may be a little small for watching videos. So transferring videos from iPhone to iPad Pro will be a good idea. As is known, iPad Pro owns 12.9-inch display with the resolution of 2732*2048, so it will be good enough for watching your 4K video. To transfer video from iPhone to iPad Pro, you will need to copy the video to computer and sync it to iPad with iTunes. As is known, videos in Camera Roll can be shared with email, messages and so on, but the videos will be compressed to improve the sharing performance. If people transfer videos from iPhone to iPad Pro with email, they may not get the 4K video. Therefore, are there other ways to transfer videos from iPhone to iPad with no any quality loss? But there’s other methods to transfer video from iPhone to iPad. For example, you can use iTunes to sync videos from iPhone to iPad. Computer will recognize iPhone as a digital camera and allow users to move the photos and videos from iPhone to computer, so people only need to move the videos to computer and then sync them to iPad. When you are going to sync videos to iPad with iTunes, please be aware of the available contents in your iPad Videos app, because iTunes will erase the contents during the sync. 1. Connect iPhone to computer with the USB cable. iPhone can be read as a removable disk. 2. Double click the icon of iPhone in “My Computer” and open “DCIM” folder. Then find the videos you have recorded. 3. Copy and paste the videos to computer. 4. 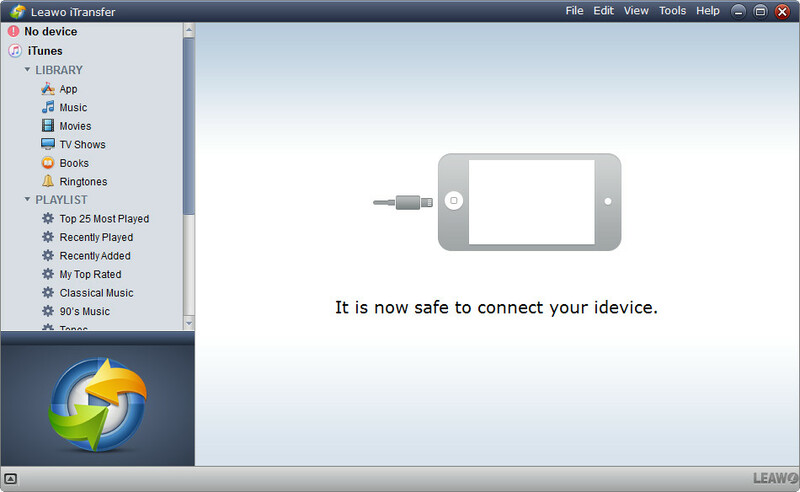 Disconnect iPhone and plug iPad into computer via the USB cable. Launch iTunes. 5. Click “File” at the upper left corner and then choose “Add File to Library” to add videos. 6. Sync iPad with iTunes. Then the videos can be moved to your iPad. 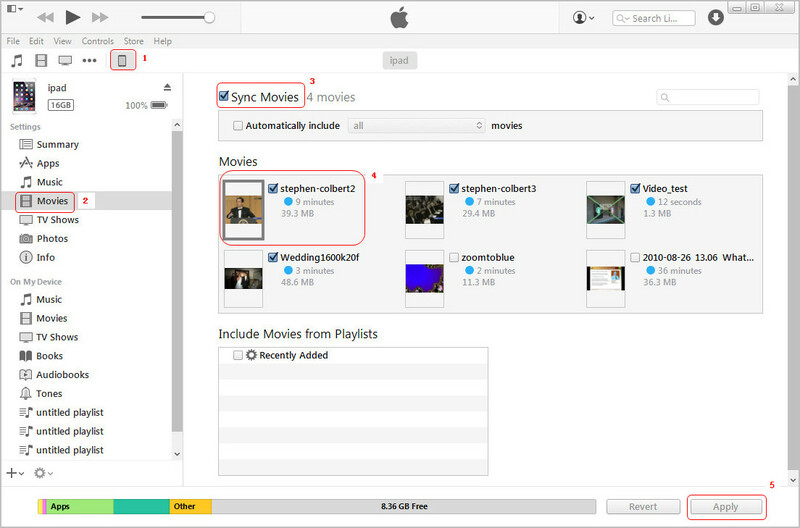 An app for iPhone and iPad will help you to sync videos from iPhone to iPad. 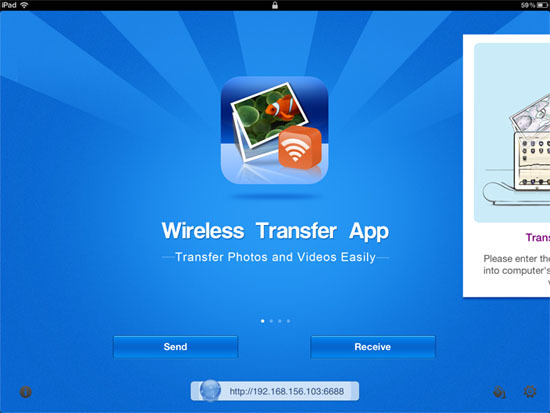 To use Wireless Transfer App for the video transfer, you’ll need to install the app on both your iPhone and iPad and run it. Connect to the same Wi-Fi so that the app can automatically detect the devices which are using the same Wi-Fi connection. Tap the receive button on your iPad, then choose the name of the iPhone. Select the videos you want to transfer and then tap the Download button on your iPad. Then the app will start transferring videos from iPhone to iPad. The guide below will detailedly show you how to do that. 2. Make sure your iPad and your iPhone are connected to the same Wi-Fi network. 3. Make sure both your iPad and your iPhone have Wireless Transfer App running. 4. Tap the Send button on your iPhone, choose to send photos & videos to iPod/iPhone/iPad and then select photos and videos for sending. 5. Tap the Receive button on your iPad. Then you will find the device name of your iPhone. 6. Tap the name of your iPhone. Choose to save the selected photos and videos to an existing album or a new album. Tap the “Download” button to start to download the selected photos and videos. 7. The selected photos and videos will be downloaded to the photo library in your iPad. 8. 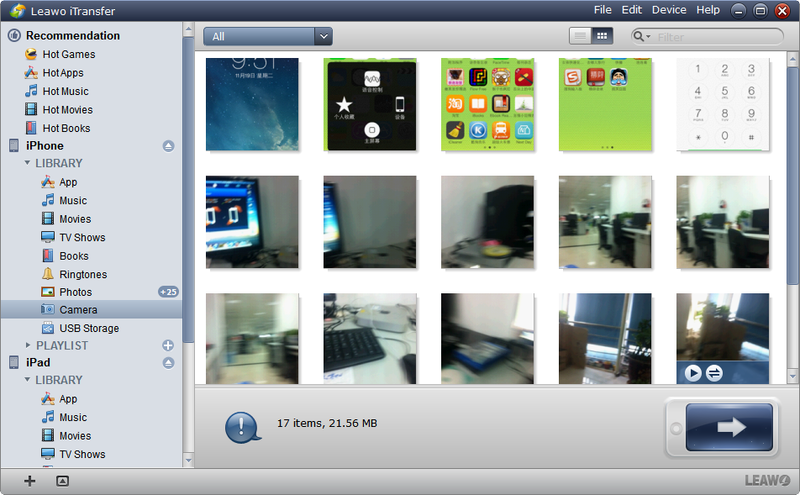 Launch the “Photos” app in your iPad and you will find all the photos and videos downloaded from your iPhone. 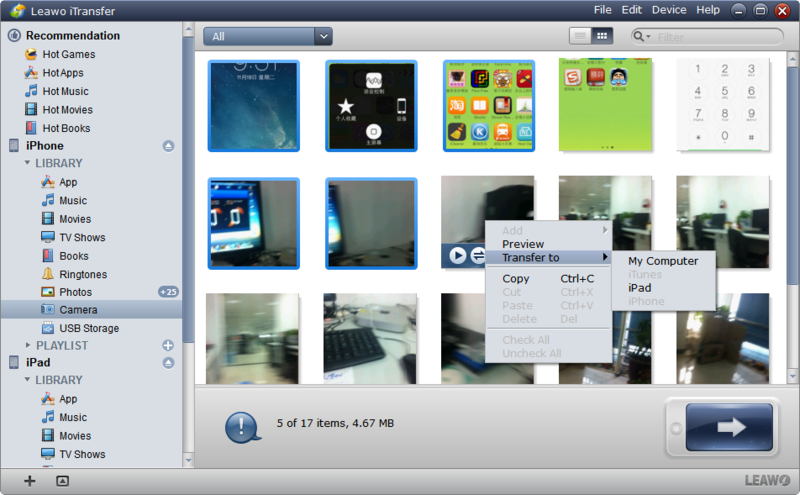 You can also use the third-party iPad transfer software to transfer all videos from iPhone to iPad. Leawo iTransfer provides much help at this moment. 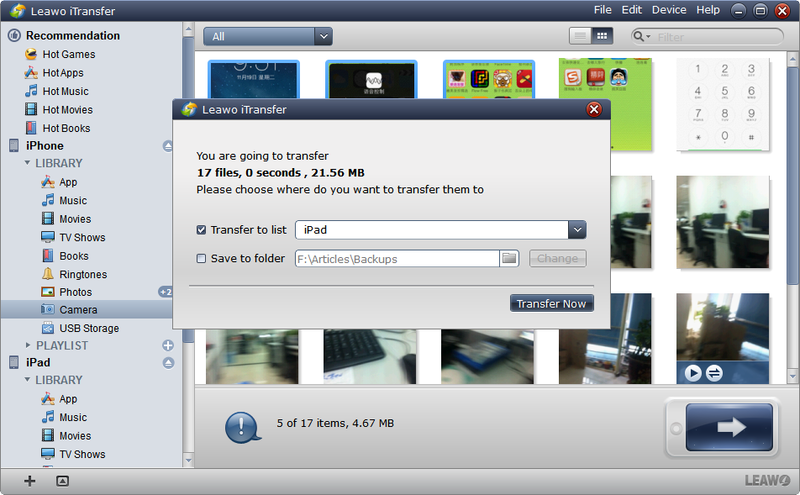 This software is used for transferring files among iOS devices, iTunes and computers, and it enables users to transfer videos from iPhone to iPad Pro directly without using iTunes. The following guidance will show you how to do that, and you can free download the software to have a try. Step 1. Run Leawo iTransfer and connect both iPhone and iPad to computer with USB. Step 2. Click the name of iPhone and choose Camera in the left sidebar. The contents show up in the right part. Step 3. Select the videos you want to transfer and click the transfer button at the right bottom. Or right-click the selected files and choose Transfer to > iPad Pro. Step 4. Check Transfer to list in the pop-up dialog and choose iPad Pro as target. Then click Transfer Now. The software will start transferring videos from iPhone to iPad. When the transfer finishes, you will get the videos in iPad Pro’s Videos app, and you can enjoy the video with its original quality. As mentioned, the 4K videos are always large in size, so it will take a while for Leawo iTransfer to finish the transfer. This iPad transfer software is also helpful for other kinds of data transfers, for example, you can transfer pictures to iPhone 6s with it. If you are interested in Leawo iTransfer, just check it out.